DJ And Producer Kassey Voorn has been a solid supporter of my work on Greta Cottage Workshop and Dirty Works. He has also been a great source of inspiration to me for the last few years so I was thrilled when he approached me to do a remix for him. 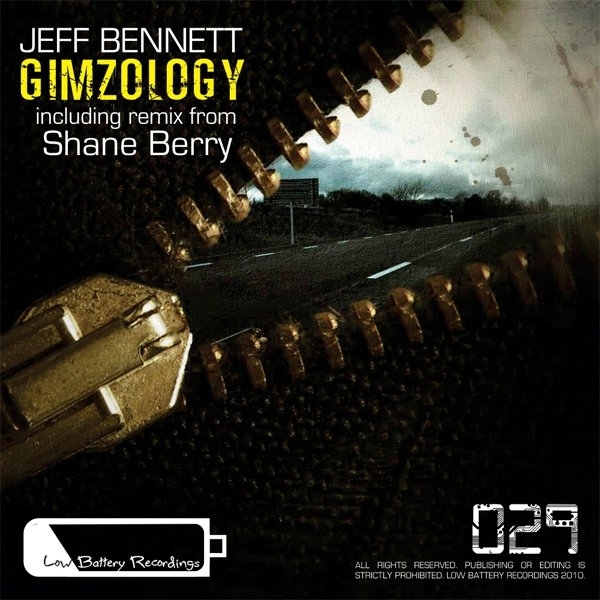 The remix is of a track called Gimzology by Swedish legend Jeff Bennet for Low Battery Recordings. Release date January 12 2011. I had a great time working on this project and garnered a great amount of technical growth from it. It has been, by far, the most challenging behind the scenes endeavor to date . Mr Bennet is an accomplished and well loved producer and working to, and matching, his high quality (and volume!) was an exercise in itself. I tend to work at a very low volumes with a ton of headroom and since I have no delusions of grandeur regarding my “mastering” skills I get Matt Densham at Greta Cottage Workshop to do all the dirty work for me. So regarding my own “mastering” skills (read: making-things-competitively-loud skills) I must admit it was quite a struggle to get my remix to sit at a compatible volume with Jeff’s finished work yet retain the nuances of my softer mixing style. But my first submission was noticeably softer than the original track and it simply had to come up in volume. Now before we venture off into The Loudness Wars debacle let me just say I am, rather reluctantly I might add, in the “if you can’t beat them Join them” camp – for now – and besides in the end I grew as a producer from the process of re-looking at my mixing/compressing/EQing strategies and pushed the boundaries of my own expectations and needs as an artist. To cut a long story short we tried a few versions, even had someone else take a bash at mastering the two tracks together, but in the end we settled on the second to last mix down I submitted just before the end of last year and I think I did pretty good job of coming close to matching Mr Bennet’s output and quality. It’s a strong release if I do say so myself, Mr Voorn and Mr Bennet are a pleasure to work with and I look forward to doing more work with them in the future.